Featured in NRA American Rifleman Magazine. Made from Mil Spec paracord 2 point sling with quick connect swivels. Adjustable from 33" to 44" and is lightweight and comfortable. Has hundreds of survival uses, making this sling functional in many ways if needed in an emergency. Perfect for use as a rifle sling, shotgun sling, and even a crossbow sling! And looks great on all firearms, both traditional and tactical. Comes in Camo with Olive Drab. 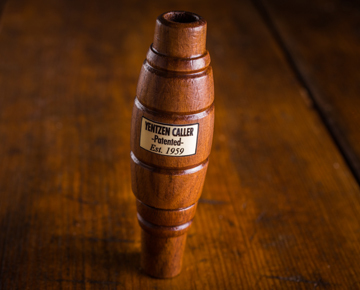 And has a signature branded Sure-Shot Game Calls band that doubles as a handle to keep your gun steady when navigating rough terrain, timber,and marsh. The GUNSLING by Sure-Shot Game Calls matches and teams up perfectly with The LANYARD by Sure-Shot Game Calls. Like the product esp. the para cord wrap. Standard swivels work well. Only concern is that the para cord portion could be wrapped around a wider top web; might make it a little more comfortable for a long walk. Otherwise cool product and good price.